The English #wikipedia article about the earth quake is being written as the situation develops. As you can imagine, depending on the size of the waves, the Tsunami can create havoc in the many countries that border on the pacific. The recent earth quake and tsunami in Haiti proved to be a disaster because it was not expected and, the buildings proved to be too fragile resulting in too many fatalities. As there was no infrastructure and a lack of decent information after the quake, people turned to OpenStreetMap to create the much needed maps. The BBC has a great photo presentation about this ..
OSM 2008: A Year of Edits from ItoWorld on Vimeo. This video shows "a year of edits" and indeed it shows how awesome OpenStreetMap is. One of the lessons of Haiti is that it is important to have such maps and, that it is best to have those maps when disaster strikes. 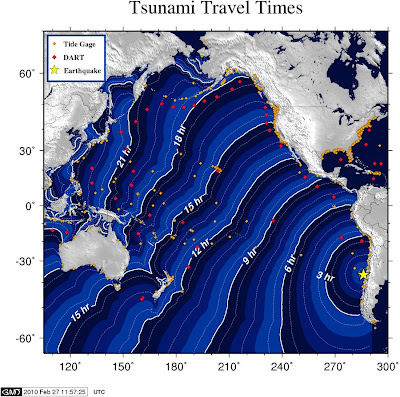 The current tsunami may do a lot of damage in the pacific. I hope that OSM maps will not be necessary and I certainly hope that they need not be created. What I do know is that you can localise OpenStreetmap at translatewiki.net. I am sure that great useful maps are needed by local people everywhere even when there is no disaster. "Psst! Wanna buy an alphabet?"